Finally the sampler is finished! This one is to be a Christmas present for her friend and Esther will now make one for herself. She plans to send it to Barbara without mounting or framing so she can choose just how she wants to use it. 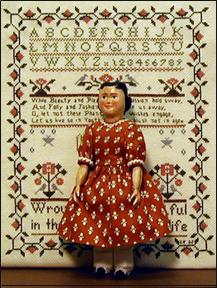 If she creates the illustration of the sampler Little Thankful made in the Hitty book she will not use the first line of the alphabet and one of her Hitty dolls would be facing the sampler. Perhaps she will only want to keep it as a keepsake. Esther and Russell have been trying to decide on a design for the cover of this journal so when the sampler was finished she took my picture standing in front of it. It turned out to be a delightful picture and we all deemed that it would make a suitable cover. I do like posing for pictures. If the truth be known I like all the attention I can get. I do like being where I can hear and see all that is happening. One day this past week a reporter and photographer from a local newspaper came to interview Esther about the Impressionist art rooms that she has created in miniature. She does hope the story is correct when it appears in print because it seems difficult to explain to someone who is not familiar with the miniature hobby. Later in the week she pinched a nerve in her leg and is still at this writing having trouble walking. It is improving. Another day of not walking much will hopefully take care of it. It did not stop her, however, from going out to dinner in the evening. I understand the next significant event will be a trip to Maryland for the Thanksgiving holiday. This will be my first real holiday and I am looking forward to it. Most certainly I will be included in the festivities. These days before we leave are devoted to little details such as stopping mail delivery etc. Also, this time of year the weather is a factor. Russell does not like to drive in snow on the Pennsylvania Turnpike through the mountains. A doll can not be of any help in such a situation so I will just keep hoping for dry roads on our travel days.